By choice or by fate, I cannot escape Pinot Noir. I was born in Oregon and returned to its wine industry. 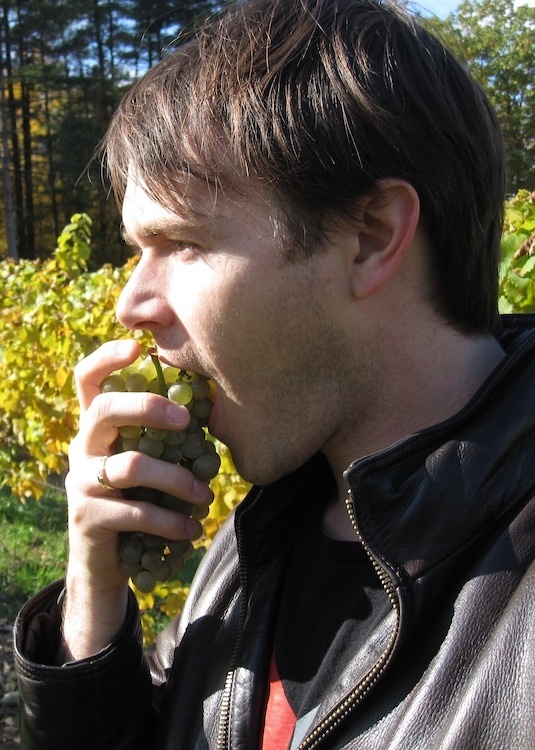 Our traipse through the extreme wines of Vancouver Island have gone from bad to worse to decent, usually faltering with noble grapes like Chardonnay (here), Gamay (here), but succeeding with weird hybrids like Savignette (read here). Can this warm pocket in the Northernmost fringes of winemaking pull off the queen of grapes: Pinot Noir? We will recap our visit to De Vine Vineyards in a future post. Their attempt to tame Pinot Noir is interesting. To get any color or fruit, they put the wine through carbonic maceration, aka Beaujolais nouveau-style, closed tank, forced fermentation and then, oddly age it for six months in French barrels. The result? The APPEARANCE looks a clear medium purple with cranberry highlights. Medium AROMAS of pepper, tart strawberry, red cherry, dried white mushrooms. FLAVORS taste bright and quick with tart red fruits like strawberry, cranberry, followed by a light dry wood and vanilla, finishing shortly thereafter. One of the last vintages by the Dosmans: who toiled twenty five years to turn Vancouver Island into wine country inCowichan Valley. The APPEARANCE looks clear, ruby red, with a wide clear meniscus. The AROMAS smell of medium, if a bit wild, grapefruit twang, tart red cherry, pomegranate, brett leather, light tobacco ash, white pepper. The PALATE is dry, lean, light, and tightly cut with acidity, light tannins, a mild 12.8% abv. Medium plus FLAVORS show a contrast between mulled wine, pomegranate, tart zip and wild musk that cary a medium plus length. 65 acres, 8.5 planted but soon to be 15 (wow) in the Cowichan Valley. BUT! And this is a big but. Quill is 50% Vancouver Island Pinot Noir 50% Okanagan: the Okanagan being Canada’s hottest, sunniest, warmest continental climate nearly on par with the Columbia Valley. The APPEARANCE looks a medium intense ruby with a purple core. Medium intense AROMAS pop and mellow with orange juice, herbs like fennel, pepper, rhubarb and red cranberry, and a touch of Brett. The PALATE is dry with medium, yes, only medium acidity (your dentist will thank you), medium grape skin tannins, a medium body, and a soft cheese texture. Medium intense FLAVORS run from red cherry with a dash of orange juice to rhubarb, young brie, and that earth and licorice herbaciousness, like fennel, that carries a medium plus length. So, who makes the better Pinot Noir? De Vine, Alderlea, or Blue Grouse? De Vine’s nouveau Pinot tastes pleasant and inoffensive enough (3 of 5 score), but memorable? Nah. Left open, our various other bottles from here never calmed after a day. But Alderlea’s Pinot finally turned its sprint into a mellower marathon. The structure and leanness remain, but the edge is gone. Dried local cheddars work well, kalamata olives calm Alderlea’s Pinot down, mellowing it into a simple, black cherry juice, game hen, herbed chicken, balsamic laced items would work. Day 2 Alderlea’s Pinot is very good (4 of 5). My advice: decant or let it sleep the night open. Meanwhile, Blue Grouse’s Quill drank quite well (4 of 5) out of the gate. It came off more supple, tame, and pleasant. Alderlea’s wine might technically be more complex, intense, and ageable. But for the moment, Blue Grouse, thanks to the boost of warm Okanagan fruit comes off more agreeable. So, choose your poison: a quaffable missive; history, terroir, and challenge; or blurry but pleasant ease. This entry was posted in Pinot Noir, Uncategorized and tagged Burgundy, Canada, Canadian wine, drink, Oregon, pinot noir, travel, Vancouver, Vancouver Island, wine. Bookmark the permalink. I’ve never been a fan of Canadian Wine as the land and soils are (my opinion) ill suited or growing grapes and the growing season is way to short most year. Nice post however and I’ll give then another try. It’s pretty desperate up there, but I am fascinated that they try. Rooting for the underdog I guess.